Wait, does Pink Ribbon™ Barbie® – in her frothy pink gown, long pink gloves, pink tulle stole and, of course, the ubiquitous pink ribbon – really have breast cancer? Or is Mattel just trying to capitalize on the emotions of women and girls to sell dolls? As a breast cancer survivor, I’m not nearly as excited about Pink Ribbon™ Barbie® as Mattel appears to be. Let’s start with Barbie’s role in opening the dialogue between women with breast cancer and girls. What is it about this plastic, disproportioned doll that represents breast cancer patients? Is it her flowing blond hair? No, most women in treatment lose theirs. Is it the cute little breast prosthesis that comes with the doll? No, among the many accessories created for Barbie, there is no prosthesis. Mind you, those firm plastic breasts could symbolize a really bad reconstruction job, or maybe the hardening that comes with radiation treatment. But no, Barbie is not lop-sided, she still has her lovely locks, and she doesn’t live with the fear of recurrence that plagues survivors, much as most of us have learned to seize the day and make the most of life now. But she does represent a real link to cancer. This Barbie and all her many older ‘sisters’ are made out of PVC (polyvinyl chloride) plastic. The company has been quoted as saying it will eliminate this toxic plastic ingredient that has been linked to cancer – it did phase out hormone-disrupting phthalates, another common toy ingredient of concern – but as of early April ‘09, you still won’t find a PVC-free Barbie in stores near you. Back in 1997, Greenpeace concluded, after a two-year investigation, that PVC – commonly known as “vinyl” or by its #3 symbol – is the worst plastic for the environment. The production, use and disposal of PVC is a leading source of dioxin in the environment, and according to the International Agency for Research on Cancer, dioxin is a Class 1 carcinogen – known to cause cancer in humans. Poor Barbie. No wait, I’m getting confused again (chemo-brain, still?). It’s not Barbie that’s poor – she’s just a toxic doll, too dumb to know the difference. It’s our children that I worry about. There is a risk of dioxins seeping from plastic dolls, particularly older ones, and from dolls left out in the sun or in very warm places. That may be going a bit far, but there’s no doubt that many people believe that cancer is inevitable. A recent poll by the Canadian Partnership Against Cancer shows that almost half of Canadians – 43 per cent – believe that developing cancer is just a matter of chance. My own daughter spurred me to get involved in the cancer prevention movement when I urged her to stop sunbathing in the blazing heat of the day. “Everyone gets cancer, Mom. There’s no point trying to do anything about it.” Little wonder my teen felt that way – her mom, her best-friend’s mom, her boyfriend’s mom – we all had cancer. Is cancer inevitable and all chance? Of course not! We know that well over half of cancers are preventable– and that prevention can and must go well beyond the ‘lifestyle’ factors cited by the cancer agencies. Of course, don’t smoke and yes, eat healthy food, AND let’s get rid of the PVC plastic and asbestos and dioxin too. That’s the message we need to get out to our young people. Mattel has offered to donate $2.50 for each doll sold, with a guaranteed minimum donation of $25,000 and a maximum of $100,000. While we are extremely fortunate in Canada not to have to worry about the cost of health care, treatment in the US averages $300,000 per breast cancer patient. How far will $100,000 go? You are far better off donating to the organization of your choice. Better still – donate to prevention. Prevention has always been the cheapest, most comprehensive and most effective – never mind the most humane way – to reduce illness. That’s where Prevent Cancer Now comes in. Our work focuses on education and action for prevention – what you can do to reduce or eliminate carcinogens in your life. Just as importantly, we work with legislators and regulators to eliminate them in the first place. We have a big job ahead of us. We hope you will join us. Forget the pink ribbons and support prevention! 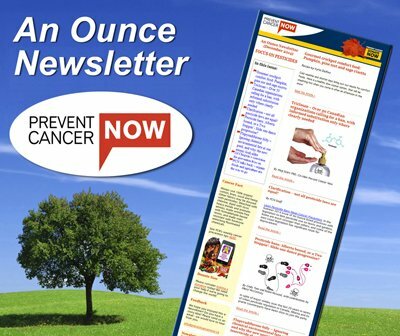 Right now, during Cancer Month, please join us to help raise funds for Prevent Cancer Now. Or click here to make a donation today – do it now before you forget!